That figure has indeed grown, more than tripling as of Wednesday to 350, according to statements from Boston Globe staff leading the project, and will potentially be even greater by Thursday morning, when the coordinated editorials are set to run nationwide. The Globe initiative comes amid the president’s repeated verbal attacks on journalists, calling mainstream press organizations “fake news” and “the enemy of the American people.” Tensions came to a boil in early August when CNN reporter Jim Acosta walked out of a press briefing after White House spokeswoman Sarah Sanders refused to refute Trump’s “enemy of the people” comments. 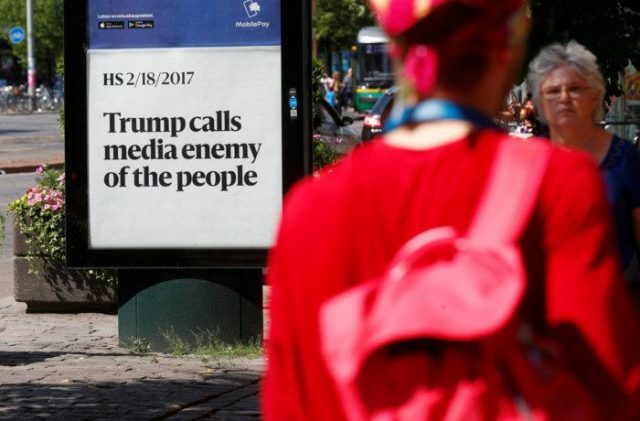 Meanwhile, Al Tompkins at The Poynter Institute – a five decade award-winning journalist and producer – has some interesting analysisconsidering he is a commentator who is opposed to Trump and wishes the president would knock it off with the fake news is the “enemy of the people” nonsense. Despite saying this right off the top, Tompkins then proceeds to shred the initiative as completely futile while simultaneously a bit hypocritical given an elite press that’s perpetually walled itself off from ever having to admit its wrong (for the easiest and most obvious example in most people’s recent memory let’s simply start with the Iraq war). We will protest again that we are really good for democracy, that we are vital to the nation… and the people who agree with the president won’t give a damn what 200-plus newspaper editorials or a thousand editorials have to say. Tompkins brings a common-sense perspective, likely echoing what most average Americans might be thinking right now, ultimately concluding of the breathless headlines now promising 350 “pro-journalism editorials” that it’ll be little more than the usual self-congratulatory and meaningless noise that many Americans have come to expect from the mainstream press. So the editorials Thursday will create a lot of chatter. Trump backers will call journalists whiners and journalists will counter-attack. Twitter and cable news will have a ball with it all. And Friday morning we will be right where we were this morning. And crucially Tompkins, himself a prominent longtime educator of journalists across the nation, says that journalists as a collective profession have gotten so much disastrously wrong yet remain intransigent, and the American people understand this well. Lots of journalists were surprised after the 2016 election. We vowed to listen to the public more, to find out why we were so surprised to hear that the public didn’t love journalists and a growing number didn’t believe us. Before you publish your editorials extolling the virtues of journalism, ask yourself: How are you doing with that listening tour? How have you changed because of what you learned? How willing are you to be changed by discourse? Whatever you write in your editorials, are you willing to listen, too? Shockingly common-sense and truthful words coming from the heart of establishment journalism… We find ourselves surprised to say on these points, we couldn’t agree more.